Unicef, the United Nations Children’s Fund, said the assault in Idlib Province may have been the deadliest on a school since the Syrian war began more than five years ago. A school compound in a rebel-held part of northern Syria was repeatedly hit by airstrikes on Wednesday in an assault that monitoring groups and rescuers said had left dozens of people dead, including many children. Twenty-two children and six teachers were killed in the strikes, Unicef said. Other estimates, including those from witnesses quoted by Agence France-Presse, said at least 35 civilians had died. The Syrian Observatory for Human Rights, a monitoring group, said warplanes it identified as either Syrian or Russian made at least six strikes on the village of Haas, including on the school compound. The White Helmets, a civil defense group, posted photographs of obliterated buildings on Twitter, and said that at least seven airstrikes had hit a three-school complex in Haas. The targeted area in Idlib is controlled by an alliance of rebel groups opposed to President Bashar al-Assad of Syria. It has frequently been bombed by Mr. Assad’s air force and its Russian ally, which intervened to help him more than a year ago. 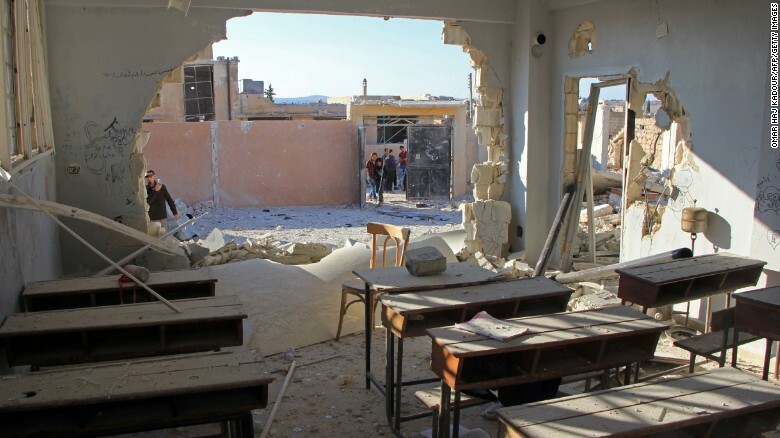 Reports in the state-run Syrian news media said militants had been targeted by government forces in Haas, but there was no mention of a school assault. At the United Nations, the Russian ambassador, Vitaly I. Churkin, said he knew nothing about the assault. “It’s horrible. I hope we were not involved,” he said. Russia and Syria have been increasingly assailed by the United States and other supporters of the Syrian opposition for what they call indiscriminate bombings that kill civilians in the conflict. Mr. Assad and his supporters say they are targeting terrorists. Estimates of civilian deaths since the conflict began in March 2011 range from 300,000 to 470,000. Roughly half the country’s population has been displaced.